One of the benefits of being a Club Members is the availability of technical information. 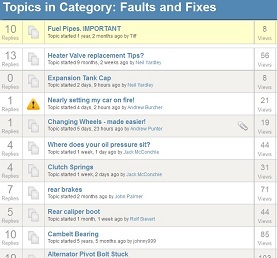 As a member, you get access to our Faults and Fixes Forum which contains hundreds of posts going back a number of years. If you have a technical problem or question, there is a good chance you will find the answer here. Remember, this forum is only available to members. Also, we have a large number of technical articles in the members area of the site. These can be found under the "X1/9 info" menu (you must be logged on and a current member to see this). New Wiring Diagrams Available - Steve Sharpe has been busy producing some new wiring diagrams. Not all models are currently covered, but diagrams are available for 1979, 1980-1982 and 1985 onwards. A big thanks to Steve for these - please add some comments to the article to show your appreciation. These are available in the Technical Information section under the X1/9 info menu or click here (this link will only work for logged on Club members). 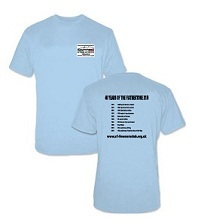 We have some limited remaining stock of this year's National Event t-shirt (currently only available in S, M, L and XL). Celebrating the 40th anniversary of the X1/9, they're sure to sell fast so order quickly to avoid disappointment. Fancy an affordable Alfa roadster... from Japan? First Alfa teased us with the 8C but they only made five hundred and it was a bit on the expensive side. Then they showed us the 4C concept which they intend to put into production in 2013. It's mid-engined and rear-wheel drive, so possibly the nearest we'll see to the X1/9 experience, but Alfa only intend to make 2,500 a year and it's still a bit pricey. But good news may be on the way. Fiat are teaming up with Mazda to develop a new roadster platform. It will underpin the next generation MX-5 and also a new Alfa roadster. Both cars will have their own individual engines and designs, but will share a common platform. Both the Mazda and Alfa variants will be built in Japan. So, the first affordable, rear-wheel drive roadster from Fiat for many a year, but would you be prepared to drive an Alfa with Japanese DNA? Our Forum is Now Open! We now have a forum that is open to club members and non-members alike. At present anyone can view the forum, but a logon is needed to post. All club members should have received a new wesbite logon last week - this will give you access to the forum automatically. UPDATE - You can now register on the website automatically - just use the "Create an Account" link on the login box. You will then be able to post to our forum. Please read this note for further details. Bertone's latest design masterpiece, the Nuccio (named after Giuseppe "Nuccio" Bertone) has been making a stir at the Geneva motor show in March this year and more recently at the Beijing Motor Show. In fact a Chinese collector has taken such a shine to the car that they are in negotiations with Bertone to buy it for a cool $2.7 million.